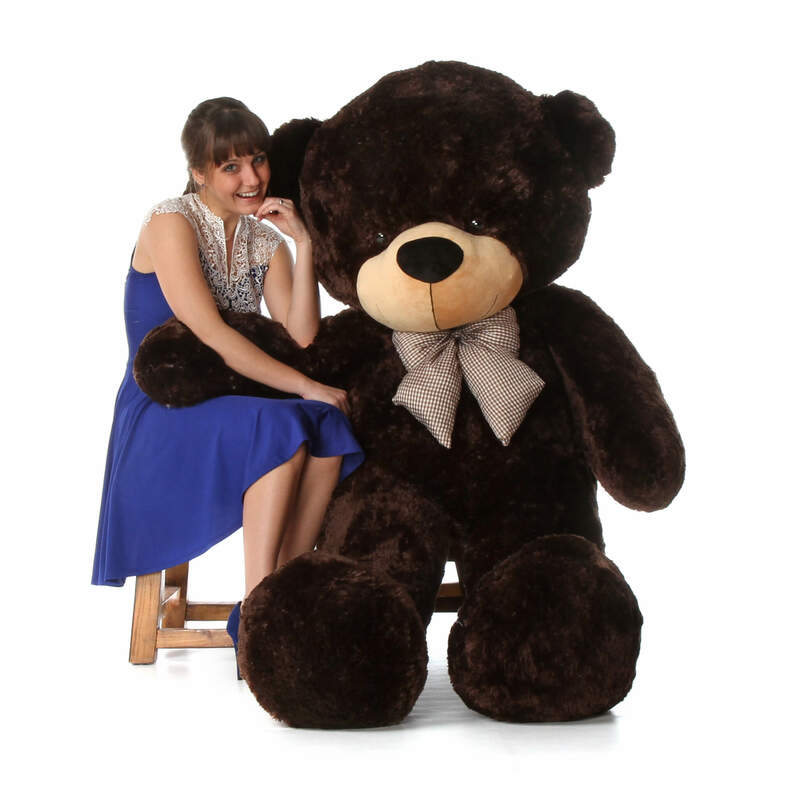 Give the gift of friendship and tenderness with a Giant Teddy stuffed bear like Brownie Cuddles. Brownie is a giant teddy bear that stands at just over 6 Feet tall! An extremely soft and huggable bear with a heavenly plush chocolate brown coat. Its big brown eyes are filled with a lively twinkle, an expression of the love and kindness that extends to Brownie's new home! Its chubby nose is made of smooth velveteen fabric; divinely soothing to the touch. This extra large teddy bear measures 72" inches to be exact. It wears a dashing checkered bow that adds the right touch of whimsy to its design. Being well constructed, durable, made with child safe fabrics and meeting or exceeding all US safety standards guarantees that Brownie Cuddles is perfect for snuggling! A wonderful collectible, as all Giant Teddy bears are! Came in just as advertised. She loved it, the card was a perfect touch. Highly recommend. The elementary school (Bret Harte) where my wife teaches has had a much smaller bear located in its library for several years. The bear was there for the young students to hug when they needed a hug. Through the years the bear was hugged out, and now the kids have a new huge bear to hug. We did explain to the kids that Santa Claus delivered the bear early because he wanted to hug Santa Claus constantly, and kept grabbing the reindeer reins while yelling into Santa's ears that he had to get to Bret Harte School because the kids were waiting for him. I bought this bear for my girlfriends birthday. They boasted about the size of it, and it definitely was true. The bear is definitely giant. The material is great quality, stuffed the right amount, and we love the way it was shipped in a vacuum sealed bag and box. A very high quality bear that will last a long time. I bought the Brownie Cuddles Soft and Huggable Chocolate Brown Giant Teddy Bear 72in. It is a very high quality bear that is very well made plus the size is amazing. Shipping was spot on coming in as promised. Thank you Giant Teddy for making a great bear that will last, It made her very happy and me too seeing how much she loved it. Will recommend them to everyone looking for a giant bear. Wow! Now that's a giant bear!! Omg it's perfect, giant, fluffy, who could ask for more? I however didn't know it came stuffed. So now have 20lbs of cotton stuffing to get rid of!!! 7 Foot Life Size Chocolate Brown Giant Teddy Bear Cuddles - The BIGGEST Teddy Bear!